Trump cancels scheduled meeting with Vladimir Putin and calls former lawyer ‘weak’ in response to new guilty plea in federal court. Donald Trump Jr. could be the next person facing renewed scrutiny on Thursday after a guilty plea in federal court by his father’s former private attorney, according to at least one expert on the case, “directly” implicates not just President Trump but his eldest son as well. Trump has reportedly canceled a scheduled meeting with Russia President Vladimir Putin at this weekend’s G20 summit and he lashed out at Michael Cohen after the former lawyer entered the guilty plea for lying to Congress about a Russian real estate deal he worked on while Trump was running for president in 2016. This is Donald Trump, in 2013, publicly bragging about building Trump Tower in Moscow. On multiple occasions, though, during the campaign, and after, Trump said this was no longer going on. 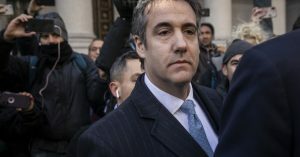 In the wake of the news, Trump spoke to reporters outside the White House where he called Cohen a “weak person” and accused him of lying to get a lighter sentence. Independent researcher and journalist Marcy Wheeler, in a post late Thursday morning, argued that Cohen’s testimony “directly” implicates both the president and “his spawn” – meaning Donald Trump Jr., the oldest of the president’s five children. The morning’s developments, especially in light of the Republican’s in the Senate blocking an effort on Wednesday to insulate the Mueller probe from further inrterference from the White House, advocacy groups like Public Citizen called on constituents to call their lawmakers and urge them to act.